To kick things off for 2016, we just had to share with you this beautifully styled shoot from Lauren Soley wedding events. With rich jewel-tones throughout and a rustic bohemian design, it's totally romantic with a laid-back vibe. 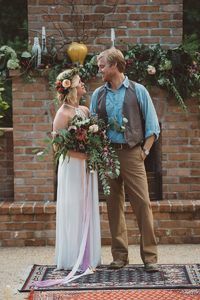 April and Paul photographed all of the flawless details for you to enjoy, see every last image here for more boho inspiration. Paper Goods & Calligraphy: Leanna Manning of Forrest Paper and Bridal Co.
For the ceremony, we used our mix match rugs from our Lovegood Wedding & Event Rentals collection and paired them with chairs from Waterloo Farms. Ginger from Ginger Cook Events created a beautiful mantle floral arrangement with pops of color and melted candle waxed bottles. To finished the look, we placed brass candlesticks down the aisle. We wanted to have a intimate table for the bride, groom, and their wedding party. Our sette Lucielle (named after my great-grandmother) was the perfect seating for the happy couple, and we added our wooden mix match chairs for the bridesmaid and groomsman. Our farm table was filled with pieces of milk glass, brass candlesticks, and a breathtaking centerpieces by Ginger Cook Events. Lovegood’s vintage china added a special touch and hand dyed napkins and table runner finished off the look. Cakes by Janice provided the three tiered cream cheese frosting cake surrounded by plums and figs on a old secretary desk from Waterloo Farms. We added the crochetted dollies to the tree to add the feel from Steve Tyler’s music video. Our wicker peacock chair trimmed with florals by Ginger Cook Events, a purple ring box, and invites by Leanna from Forrest Paper and Bridal Co.were details that were brought in to give us that boho feeling we dreamed of. Music, chickens, and the summer air gave this shoot that added charm and easygoing vibes for everyone involved. We finished the day off strong when we had an afternoon summer shower and our lovely couple danced in the rain.